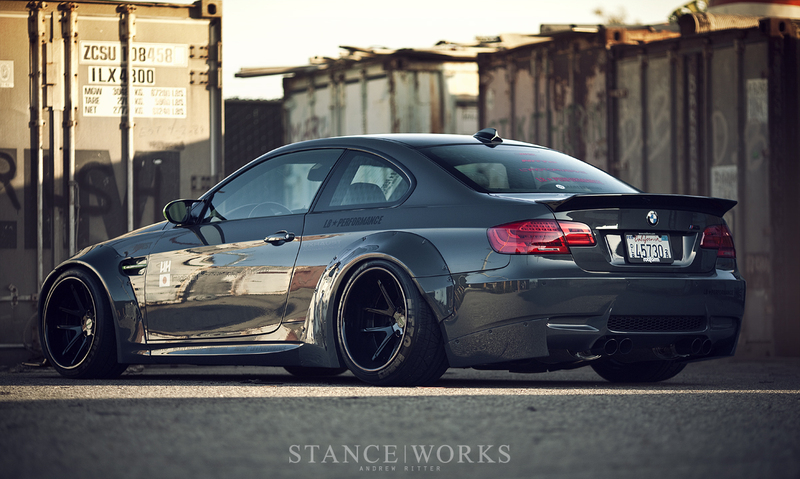 It was just a few months ago that renderings began to circulate the web; images of an E92 M3 with bolt-on fender flares that challenged the likes of Rocket Bunny and Rauh Welt (RWB) were inciting intense anticipation across the automotive aftermarket. The kit was designed by the team at Liberty Walk Performance in Japan, the group responsible for the brushed-steel-finish widebody Lamborghini that swept SEMA and seemingly every automotive magazine at the beginning of the year. They're back once again, and this time, in our own neck of the woods, with the out-going E92 M3 as their chassis of choice. To bring the project to life, LB Performance partnered with Nitto Tire, Rotiform Wheels, LT MotorWorks, and others - and we're thrilled to present one of the first looks at such a car. 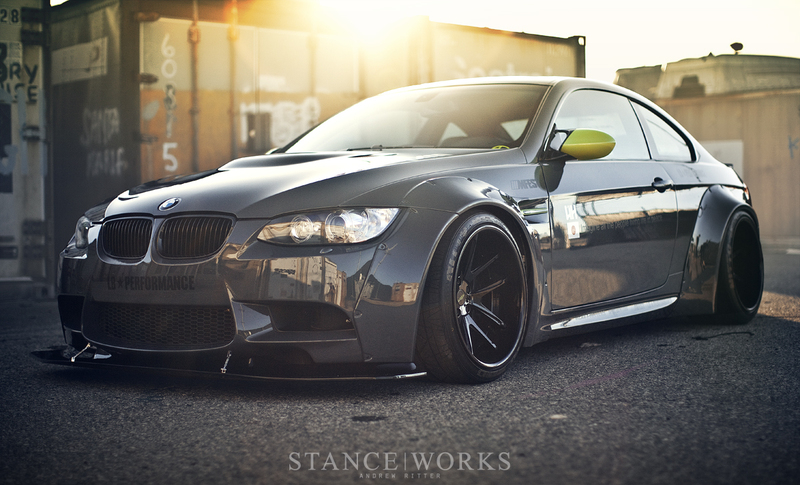 The build began at LTMW, a BMW-specific (and namely E9X chassis-based) shop located in El Monte, California. 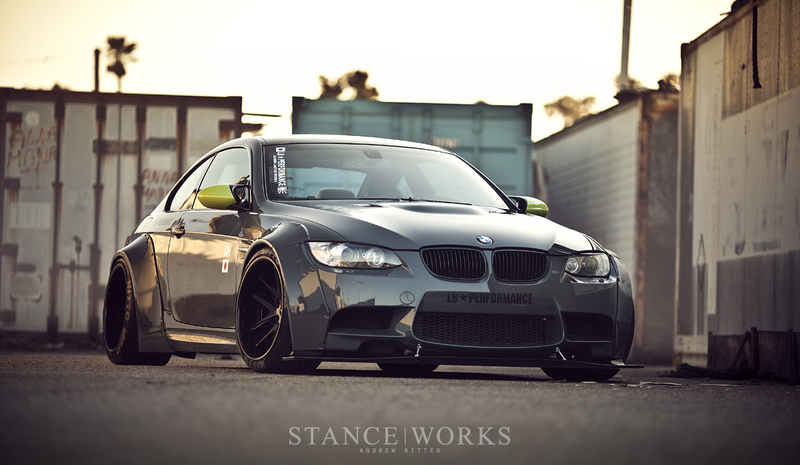 Owned and operated by Long Tran, an absolute E90/2 fanatic, LTMW was the perfect team for Wataru Kato, the owner of Liberty Walk, to enlist the help of. However, LTMW would be put to the test - their deadline was M-Fest in Las Vegas, and the amount of time between when they got the car and when it was expected to leave? A mere 30 hours. 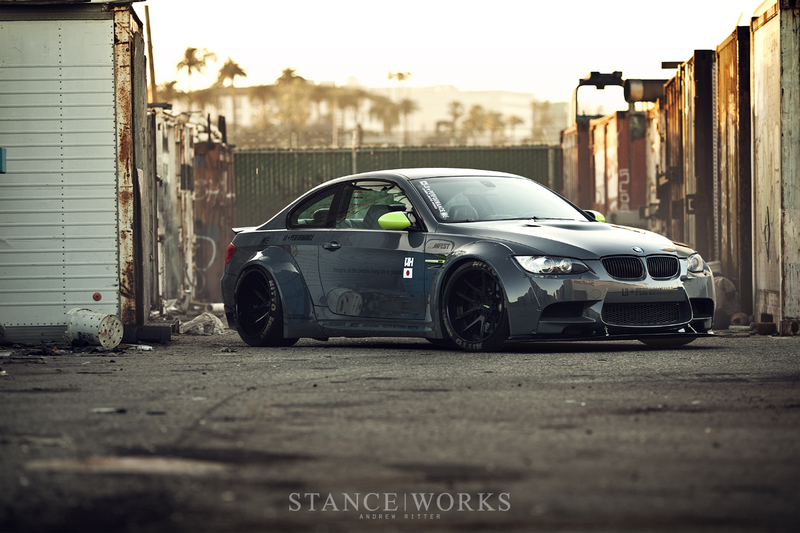 A stock M3 arrived at LTMW late wednesday afternoon, and the car had to be on the road by 6:00am Friday morning. To pull it off, all hands were on deck, and without hesitation,the car was disassembled, masked, and the car's arches were cut apart to make room for the massive bolt-on flares. Prep, fitting, and paintwork all had to be completed before the final hour - but this M3 features more than just agressive looks. Under the hood, a full ESS supercharger kit pumping out 585 horsepower gives the low-slung, aggressive M3 some matching performance. The kit produces the 40% gain over stock thanks to a Vortech V3SI blower and a high-capacity liquid intercooler system. The mean tone of the M3 is piped out through an Arqray Power exhaust system and Mastermind cross-pipe, taking the world-renowned V8 howl to exotic and super-car levels of tone, pitch, and scream. Under the car is a set of KW Clubsport coilovers, which bumps the handling up a notch while also bringing the car closer to Earth, helping to fill the wheel wells with the Rotiform SNAs and Nitto Invos. 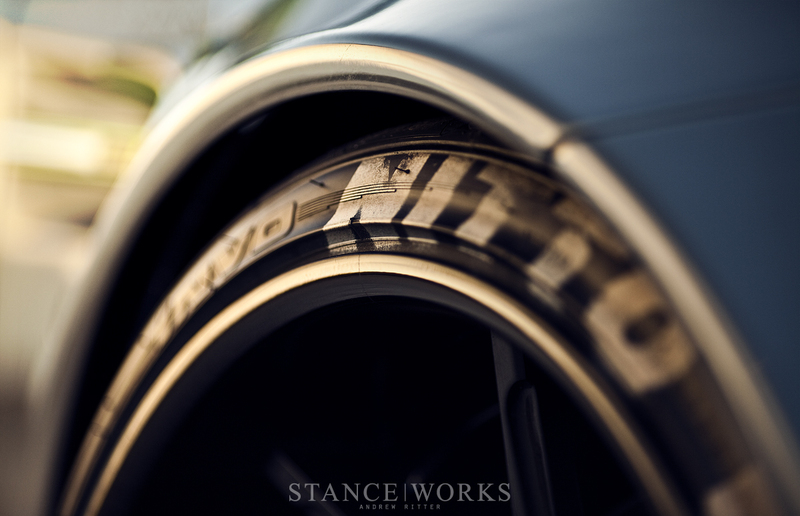 The SNAs that are tucked beneath the flares are the lowest-offset set Rotiform has ever built. Measuring out to an impressive 19x10.5 et-15 in the front and a mind-boggling 19x12 et-50 in the rear, it leaves little room to go more aggressive. 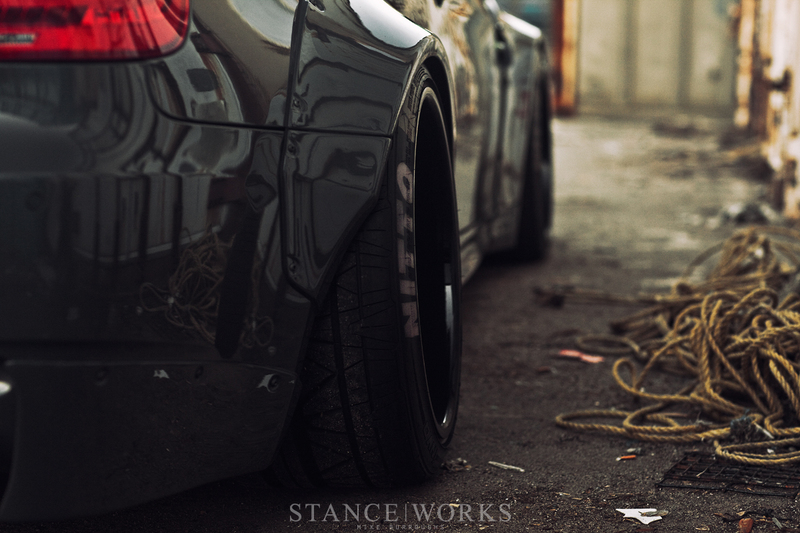 The rear wheels feature a full four inches of concave in the center, paired with a massive 7-inch lip. Offering up tires for such a wheel is the team at Nitto. 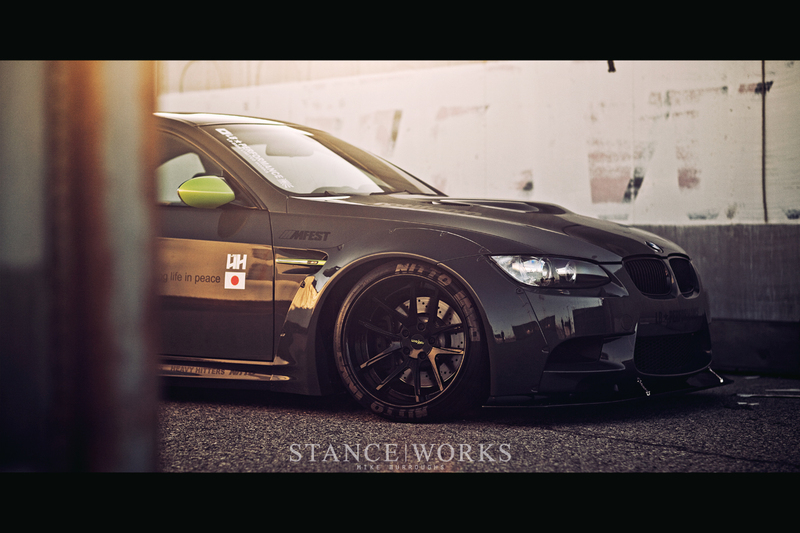 To bring the entire package the M3 has to offer to the pavement, the Rotiform wheels are wrapped in the Nitto Invo, their ultra-high-performance offering for supercars and anyone in need of maximum traction without the need for DOT R-Comps. It ices the cake that the Invo's tread pattern has to be the coolest available on the market. Despite the long list of mods and challenges, the car was completed in time, and made the trip to Las Vegas for its unveiling on Friday. The result? Immediate attention, and it's easy to see why. We're under the impression that Liberty Walk has a hit once again. However, with an $11,000 price tag on the body kit alone, we're eager to see what comes of it. In any case, the LB Performance M3 takes what is already the epitome of the modern sports coupe and takes it to an exciting new level. The lines of the kit flow perfectly with the lines BMW sculpted from the beginning. Now to convince someone to mold the kit on.... Any takers? I too thought that molding in the body kit would be cool, but it kind of defeats the purpose of the LB style of bolt on fenders. Nice post as usual! 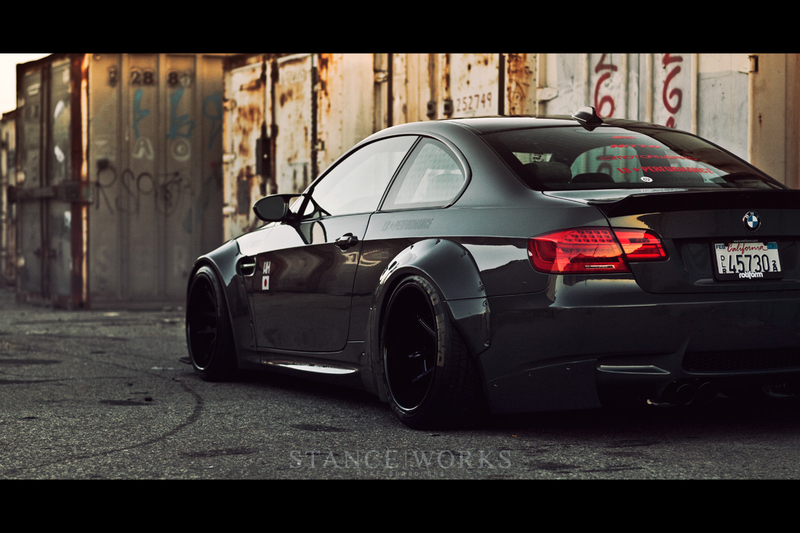 This is how JDM version of BMW should looks like! 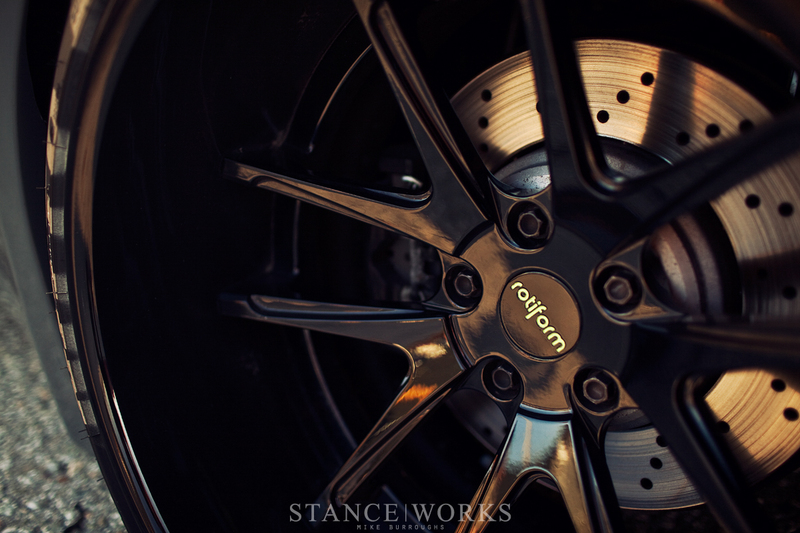 And those rotiform wheels matched perfectly. Guys , thank you for an amazing photos! What a great pair of hips! I really like the cars widebody body kits. This is probably one of the finest ever. 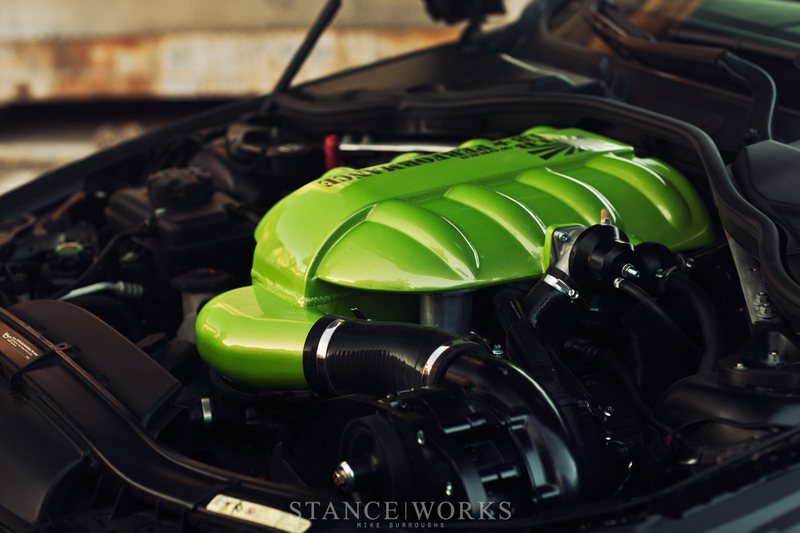 @StanceWorks @CaseyBynum all is right in the world again, thanks boys! Sorry, this just doesn’t look good. The flare rolls in the wrong direction, the paintwork on the rears is wavy, the lines don’t flow with stock at all, I’m not sure what’s going on with the yellow-green mirrors, just bad. Great car. Looks like it ready to kill puppies and take over the world. Great, fits the car perfectly, I would change the green bits to orange. Its just a copy of a rwb car, everything about it, is the same! not individual ! 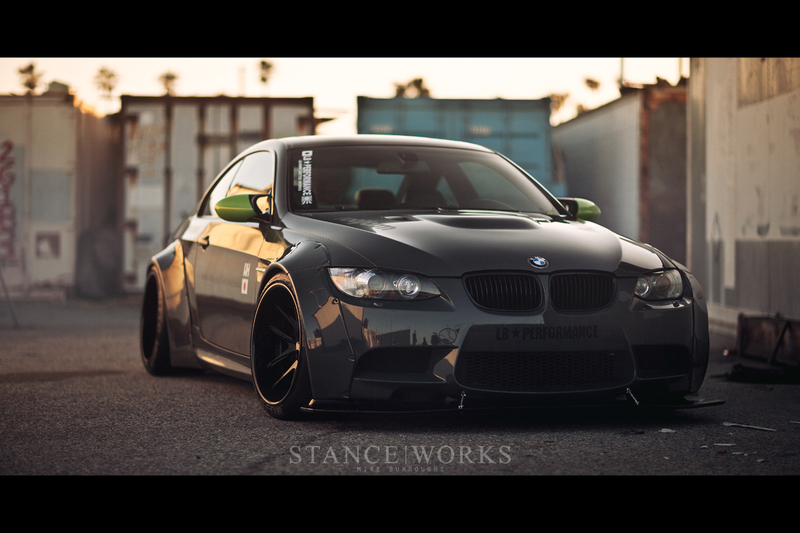 ahhh that decal on the front bumper would drive me insaaane ITS NOT STRAIGHT!! @scottycsx because it has fender flares….in that case anyone who wants extra fender clearance and a wide track is just bound to be a copy cat then. @zamm333 No not just the flares, lots about the car resembles a rwb car, ie the coloured mirrors, the writing painted on the tyres ust to name a couple! when you bring it all together ! Does anyone know the paint code for that grey? Flippin love it.